Testing different types of adhesives to find the right solution. Main goal is to find an adhesive that will be strong and not damage the phone or case. Examples of adhesives tested include 3M high strength adhesives, Velcro, suction tape, and other brands. Suction tape (F): Really bad results as the suction tape is not able to bond to phone surface nor the phone case. Velcro (D): While the Velcro does provide a tight bond between the phone and wallet case, it seems cheap and does not fit with the high quality appearance of vinyl and leather. Necal adhesive (C-): Easy to apply and remove peel cover, but leaves significant residue as seen in the image. 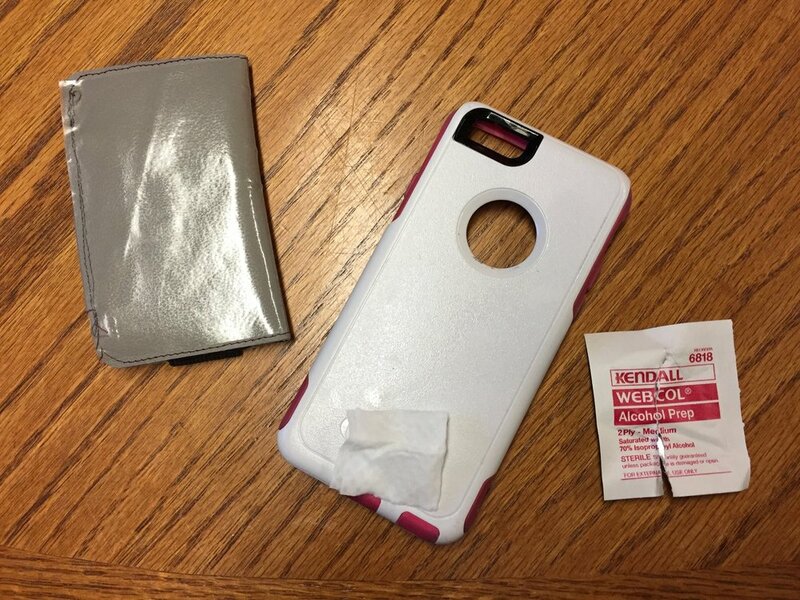 3M VHB adhesive (A-): Really strong bond between phone case and wallet. A little hard to remove the peel of tab. Will have to try different types of VHB tape. So far great results.